You want to know the truth. The king’s sons are princes? The prince’s sons are thugs. There is a gas and coal shortage. Even the teachers are on strike. What will become of our children tomorrow? We are fed up! Especially the women. Cinema is magic in the service of dreams. From October 3-28, 2013, “Caméras d’Afrique: The Films of West Africa” at the Los Angeles County Museum of Art’s Bing Theater and at Loyola Marymount University’s Mayer Theater offers the chance to see both recent films and classics of West African cinema through the eyes of the region’s own filmmakers. The project is a collaboration between two curators, Stephen Ujlaki, Dean, School of Film and Television, LMU, and Elvis Mitchell, Film Independent at LACMA Curator, and screens twenty-one films with panels and a number of filmmakers in attendance. For tickets, see www.lacma.org/film and www.sftv.lmu.edu . This article will focus on the recent award-winning film, Tey and the post-screening discussion at LMU with writer-director Alain Gomis and Elvis Mitchell. Tey is screening throughout the U. S. at select venues through November of 2013. To say that with his film, Tey, Alain Gomis has given the world something truly original is at the same time to present a pleasant paradox: his predecessors have quite admirably laid the ground. While American, Canadian, and European filmmakers of the last decades have visited a cinematic violence upon Africa — which they continue to see as a “dark” continent if only in terms of heinous civil wars, riotous and drugged boy armies, sexual hostility and brutality, pestilence hanging in the air — West African filmmakers have persistently created their own quietly reflective portraits of characters caught in the contradictions of abruptly changing societies. Ousmane Sembene (Ceddo, Xala, Faat Kiné, Moolaadé), deemed the Father of African Cinema by the 1980s, proffered a “cinema of silence.” Djibril Diop Mambéty (Touki Bouki, Hyenas, The Little Girl Who Sold the Sun)), also an actor, composer, and poet, mentored and enlisted marginalized youths as the promise of his oeuvre and his culture. He chose to exclude “chattering” from his cinema and to focus instead on images and sounds. With clear vision, regal stature, humor and heart, these two Senegalese pioneers joined others such as Cheick Oumar Sissoko (Finzán, The Garbage Boys) from Mali and the younger Abderrahmane Sissako (Waiting for Happiness, Bamako) from Mauritania in tackling some of the region’s heftiest burdens (neocolonial betrayals, the International Monetary Fund and globalization, polygamy and female circumcision, exile and displacement) with candor yet stately grace. Shamefully, the dignity and beauty of their piercing critiques has been all but lost on a world glued to screens, big and small alike, overrun by Hollywood and so-called “indie” filmmakers who fail to defy its influence. Along comes the Gentle Giant of a new generation of cinema artists, an “African” from abroad who gives us a character from afar as well. Alain Gomis, born in Paris to a white French mother and a Senegalese father, presents us with Satché, a black American played by Saul Williams, who, against cinematic if not social trends, returns to Senegal from the States to enter his culture anew — yet strangely so. As writer-director Gomis extends his film language outward from the magical tendencies of his forerunners, he paints a dreamlike world, often wordless, in which Satché floats in time all the while he direly faces the here and now of “Tey” — Wolof for “Today.” So fresh and profound is the vividly chromatic and philosophical beauty of Tey that the film baffles in its simplicity. Satché discovers, as do his family and community at the same time, that he has just this one day — today — left to live. Healthy as he is, by nightfall he will die. How can he make the most of his last moments? Gomis shows us what is of value in life, without reference to hatred or violence yet without escape of one’s fate. Rather, Tey opens in the tranquility of other-worldliness, with a black screen filled with nothing but the voices of a griot and youthful responders who repeat after him each line: “…A tale… Once upon a time… It really happened… It’s up to you to tell….” A flaming red sea at the horizon takes over the screen — is it dawn or dusk? And then comes our first of many close-ups, now on the eyes of Satché, wrapping the film in his point of view. At his mother’s home just outside Dakar, he wakes up with the words of the griot, the certitude of death that “descends upon bodies and minds,” as he gazes upon the family photos, old toys, and heirlooms in his room. His neighbors and relatives have come to console and comfort him even as each assesses him. He was a lamb, a loner, an egoist, full of rage, detached. His wife Rama (Anisia Uzeyman), especially, recalls the young man’s shortcomings. Her angst soon becomes part of a bigger picture when wide tracking shots follow him to the city with his old pal, Sélé (co-screenwriter Djolof Mbengue) and they join friends at a construction site where they are employed but now sing and dance reggae. Satché looks up his former flame (played rapturously by Aïssa Maïga, whose tearful role as a dejected singer in Bamako is unforgettable) and tucks in his shirt as he enters the modern museum in the tall glass building where she works. Devastated by her taunts, he leaves, and on the street, caves in. Is it an anxiety attack or just the beginning of the end? 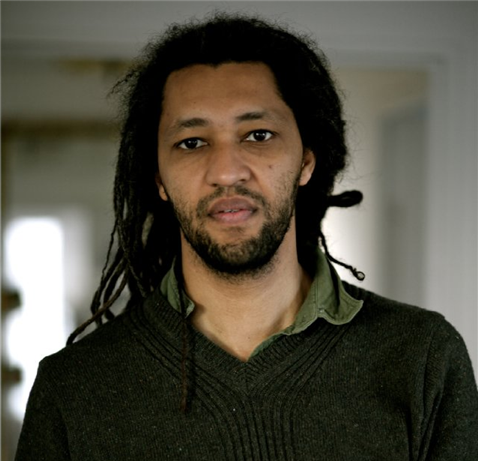 The crowd on the street picks him up, and Sélé delivers him to his Uncle Thierno (Jean Mendy), another kind of poet who would soothe that apparent devastation in a more remote shantytown where he has Satché lie down for a mock ceremonial cleansing in anticipation of what is to come. When Satché pleads that he hasn’t had time to prepare for death, Thierno tells him no one has time to finish. We just stop. In a subsequent town hall scene, Satché is both an absent participant and an observer at once. Ironically, as the film becomes more intimate when Satché returns home to his wife and children, it becomes both more silent and more definite. The emotional clarity is gripping, nearly choreographed rather than scripted in dialogue; the rhythm slows as the harmony grows and the night falls. Christelle Fournier’s camera frames Satché’s point of view through careful composition while Fabrice Rousaud’s editing modulates the poetic pace. Salimata Ndiaya’s colorful costumes add spirit and joy to a sobering occasion. Alain Gomis has made three feature films. His debut, L’Afrance won both the Silver Leopard and the Ecumenical Jury Prize at the Locarno International Film Festival in 2001. His second, Andalucia, was completed in 2007, and Tey, his third, premiered at the 2012 Berlinale in the official competition. 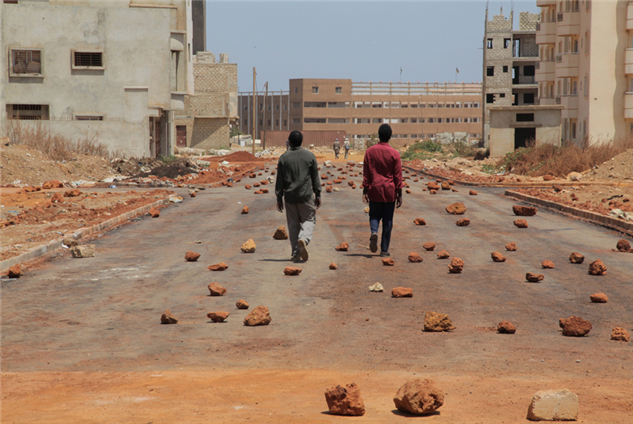 In Ouagadougou, Burkino Faso at the 2013 FESPACO, Africa’s largest and most prominent international film festival, Tey won the Golden Stallion for Best Film and for Best Actor, a first for Senegal and a first for an American actor. “I worked on the film for three years. At first I had images, of when Satché would wake up, for example. The most important were for the beginning and the end with his family. I had to find some reconciliation with death. No one wants to live longer than his children, so I wanted to deal with that. Cinema helps me to live, and to live is with films, so I was looking for a cinematic resolution for this question. You face something larger than you. At first when I was making this film, everyone said to me, “Are you sure you want to do that?” It’s so hard to find money when the character will die at the end, and also when I wanted the film to be mainly silent. The film was done “before me” — I just had to put it together. There was a thin line between my life and the film. I wanted the spectator (and that’s me) to be sitting in the head of the main character. And I wanted the film to be a journey, like on a boat. I love to dream in the cinema. In fact, it’s a good place to sleep sometimes! The film is not really on the screen; it’s in your head. I select what I give you, but you are the link; you’re making it. If you like it, it’s what you’ve made, and if you don’t, it’s the same. I could do this film forever. I’ve known Saul Williams since the film, Slam. I think he’s really talented, and he has his own way of doing things. He’s independent, and in this world where everything is marketed and it all looks the same, a big Disneyland, I’m always looking for something original. Saul has the special energy to create an aura. It’s really difficult for an actor not to use words. Saul’s face could be from Senegal. He spoke a bit of French, but there are three languages used in the film: French, Wolof, and Mandjak. 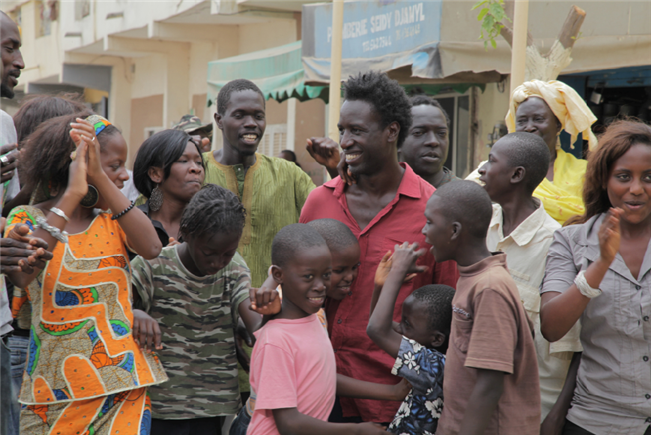 For Saul, just walking down the streets of Dakar was special; for him, as for the character, every moment was special. I didn’t know Saul before I cast him. A friend of mine just met Saul in Paris and asked for his phone number, and Saul just gave him his number, and then he saw his picture on the front page of the script, so he said yes! Yes, yes, yes, yes, yes — there is a lot of me in the script. If I want to write a character, I have to find a position, a place where we can find each other. I have to dig, and find this place to understand each other. I’m mixed: my dad’s from Senegal and my mom’s white from France, and I think it’s my job to be in each character. After we got Saul we tried to cast everyone else by working in relation to him, to get the right distance between characters. We did improvisation, trying it with the kids, too. One of the kids is my niece, and one went to the same school as my son. These key images are in the script — to have the boy’s head upside down in one shot, or the head in his hands. I wanted to capture the sensation of looking upside down, like the sound of what the nose does, the whistle. I tried to find all these sensations. I cast both women in both parts at first — for the first love and the wife — and it’s just chemistry. For the first love — because he had to leave her — she had to have something attractive and at the same time repulsive. Making time so central to the script was difficult, because the script isn’t the same as watching the film, so you have to re-adapt it when you shoot and edit. If it were possible, I would have done the script just by improvising, but I couldn’t raise money that way, so I had to write a script. If you know the sensation of each scene, you can improvise with the elements in the scene of the day. This film is a journey through time and to the present. When Satché accepts that he’s going to die, he rids himself of the future. Time is stretching in the film: he’s living for the moment, enjoying the moment, being in the moment, and finding eternity while living. Director: Alain Gomis; Screenwriters: Alain Gomis, Djolof Mbengue, with Marc Wels; Producers: Eric Idriss-Kanago, Gilles Sandoz, Oumar Sall; Cinematographer: Christelle Fournier; Editor: Fabrice Rouaud; Sound: Alioune Mbow; Set Design: Oumar Sell, Bakary Vieux Cissé; Costumes: Salimata Ndiaye; Music (2 songs): Djolof Mbengue. Cast: Saul Williams, Djolof Mbengue, Anisia Uzeyman, Aïssa Maïga, Mariko Arame, Alexandre Gomis, Anette Derneville Ka, Helene Gomis, Charlotte Mendy, Tony Mendy, Jean Mendy. Color, 88 min., DCP. In French,Wolof, and Mandjak with English subtitles.